Work refers to the effectiveness of one's stones. It is extremely important, especially in the opening, to make your stones work. Not only should you try to place each new stone effectively, but you should take care that your stones already on the board work together with the new stone. In Cool and Collected Chitoku (Taizen Chitoku), p. 48, Yoda says that does more work than W a, which would soon become a floating shape. White now builds some thickness which Yoda considers ideal. 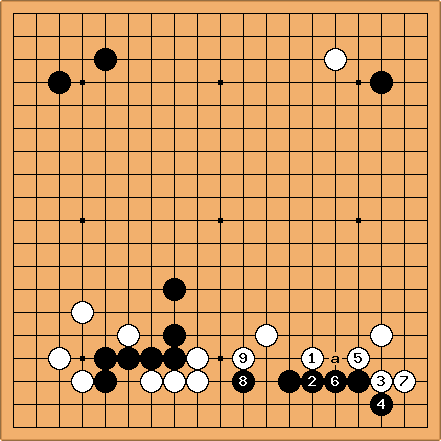 - follows joseki, but in this situation Black should play at a instead of , he says. |1] John F. Just to endorse this page by Bill, hataraku is marginally more common than moyo in the opening texts I have done word counts for. The main usage is to do with the effectiveness of some existing feature: thickness, sacrifice stones, strong shape. It's a fairly common failing among some amateurs (and I count myself as one of them) to make shapes or thickness almost for the sake of it, without thinking through how to make them effective (shows I don't like "work", I suppose - true! ).